Simply offering a tuition assistance program — no matter how generous — may not be enough to distinguish your company as a great place to work among talented and motivated employees. A successful, best-in-class program both supports and encourages participation and is strategically aligned with the company’s goals. 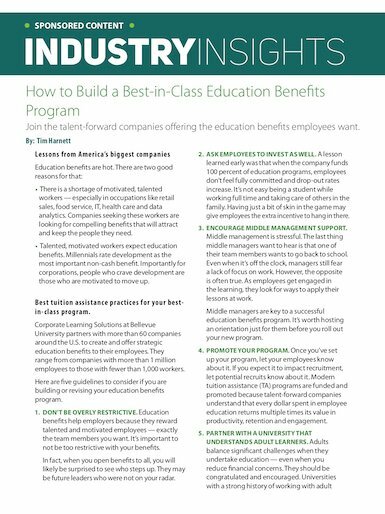 Consider these five guidelines if you are building or revising your education benefits program. The Corporate Learning Solutions division of Bellevue University works with corporations to support the productivity and competitiveness of enterprises by increasing the skills, knowledge and talents of workforces. Corporate Learning Solutions has been working with corporations for more than 25 years and has pioneered a wide range of innovation solutions to human capital development. These include the Human Capital Lab™, which measures the impact of learning on Key Performance Indicators, custom learning programs that address corporate skills and knowledge gaps, Skill Accelerator™ boot camps and Power Skills™ boot camps, which teach soft skills essential for workforce agility.